This is one of the rare large-scale figure bottles from the group, another of which is Sale 4, lot 101. Here, the identity of the figure is in no doubt. Damo is the abbreviated transliteration of the name Bodhidharma (d. 528 or 536), a South Indian Buddhist who travelled to China via the sea during the Liu Song dynasty (420 – 479). He founded Chan (Japanese: Zen) Buddhism and became its first patriarch. He is renowned for having attained his enlightenment by remaining seated facing a wall or cliff for nine years. Here he is shown in a rocky landscape setting, seated in meditation with his legs and arms hidden beneath his robes. The main subject is sufficiently impressive here to distract us from critical examination of the artistry and technique of the rest of the bottle, but there is no doubt that it is a very late work for the school. It is, indeed, the latest identifiable work from the Suzhou workshops in the entire field. The figure is depicted with considerable inspiration from a large area of dark, speckled material, the speckling around the head being on the surface and giving a freckled appearance to the figure, but elsewhere the elements of Zhiting’s Suzhou style are only a reflection of their former greatness. We note the rather random use of clumps of disassociated pine-needle clusters without any branches; and the rockwork, although in the general style of the school’s earlier works, lacks its genius. Even the robes of the seated figure are not quite as well carved and finished as one would expect of an earlier counterpart. It is also intriguing to note that the hollowing here is careless, the adequate but by no means extensive hollowing being rather fan-shaped near the shoulders. This is the only time we have found this on a Zhiting school Suzhou bottle in the collection, although it is a standard feature of later Official School bottles. The lip is not carved where the coloured markings run over into it. As a rule, the earlier carvers of the Zhiting school would certainly have carried the carving over onto the lip. 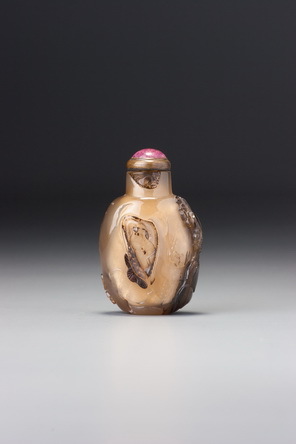 For all that, it is an impressive bottle, the figure is a delight, and the documentary value regarding style and the continued production of hardstone snuff bottles well into the second half of the nineteenth century is enormous. This is not the Sotheby’s sale catalogue. This is a product of Hugh Moss for the purposes of this website. For the catalogue details please refer to Sotheby’s website or request a copy of a printed sale catalogue from Sotheby’s.